TV coverage of any major event is a huge undertaking, but when it's as big as UEFA's Euro 2012 football tournament, you need some pretty impressive infrastructure. 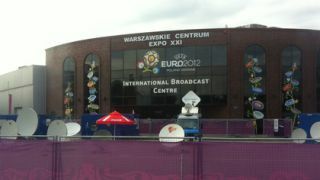 The International Broadcasting Centre, or IBC, in Warsaw is where the pictures you see are processed for transmission and TechRadar was lucky enough to be shown around the centre, which occupies two football pitches' worth of space. The IBC also includes a large-scale IT presence (backed up by a 30 strong support team) and Orange is the company that's provided the communications and data-transmission services for UEFA and for the media covering the matches. There IBC is linked to the stadiums and other venues via a bespoke communications system including fixed, IP and mobile phones, internet access plus systems for the media and commentators. The network (which includes two independent transmission paths) also carries TV pictures between the stadium and the IBC and boasts a bitrate of 70 Gbps, enabling simultaneous HD transmission from 32 cameras. Orange prepared for the event last year by creating a special lab to simulate the interoperability of the various systems used. Some of the numbers involved are staggering, with 2,500 km of optical cabling, 1,750 fixed line phones, over 7,000 networking ports and 1,000 laptops. When the footage arrives at the IBC it is then fed to the partner broadcasters. Some broadcasters, such as the BBC and ITV, have a presence at the IBC itself so they can add in bespoke camera angles alongside commentary and produce the comprehensive coverage we get in the UK. The IBC caters for 192 in broadcasters in total, while there are 44 that have space in the centre itself. However, not everybody is as committed to the tournament as our broadcasters – UEFA's Portuguese ICT senior manager Nuno Monteiro explained to us that the 44 is a lesser number than at Euro 2008, while he expects it to be less at future tournaments in 2016 (France, "maybe 30"), 2020 and 2024 ("maybe none") as broadcasters decide that they don't need to send expensive teams to the host countries. "Technology is the cause - in the past they needed to be here but now we can [produce] feeds send them over. [The broadcaster in] Portugal said no from a cost point of view. Then the production is done locally." There are 1,100 staff in the IBC which is usually a conference centre. It sits away from Warsaw's main centre and the National Stadium which has hosted some of the key matches. Many of the staff have been there for months and as we visit, some are streaming out of the doors to head for the stadium before that night's semi-final between Italy and Germany. The staff do have plenty of facilities though; there's a laundry, a TNT dispatch centre, massage chairs, a shop and a bar with beer garden. There are 57 picture feeds in total that feed into the IBC from 18 match day production crews, and everything is controlled from the Master Control Room, essentially a bigger version of a traditional TV broadcast gallery, where output is viewed from up to two simultaneous games and where the reliability of transmission across the dishes is very closely watched. It's manned by six people 24 hours a day during the tournament, since broadcasters will be working on programmes aside from the match content itself. "Basically you have the eight stadiums and the cameras collect images which are then [transferred] to a UEFA truck," explains Monteiro. "Inside the UEFA truck there's a director which is transferring them into feeds. When you are at your house watching football, you are seeing a sequence of different cameras, different angles. And then it's delivered to the technical operations centre [here]." Broadcasters can also book their own cameras into stadiums should they wish, as well as book 'flash' interviews directly after the match. This is done online or at a desk at the IBC. This provides a way for broadcasters to localise their footage. "It's not something strange for a match of England [that] the BBC would have a camera with their own feed with their own production. Why? Let's imagine for a second Portugal vs England and that England would beat Portugal. Following a goal, what do they want to see? They want to see Wayne Rooney celebrating. "The Portugese receiving the same feed… want to see the reaction of the bench. That image is being provided by the unilateral feeds. Let's imagine that the UEFA feed is following the crowd reaction, the BBC team follows Rooney. This [footage] is also delivered to the IBC via the Orange network. Even the matches in neighbouring Ukraine are also delivered to the IBC in Poland. "hey are carried to the border via root telecom and then go into the network to the IBC," says Monteiro. "The moment the images are here, there are two things that we do – either we put them on the satellite dishes, manly on the 4.9 metre satellite dish, or we [pipe it] into the broadcasters studios here [at the IBC] meaning that even the feed of Rooney playing goes via the Orange network into the IBC." All the games are shown in HD, with the final being broadcast in 3D because "broadcasters asked for it" says Monteiro. There will be 11 3D cameras on duty. And it's not just the pictures that get special attention – Monteiro again: "In our setup the sound is as fast as light. We have about 50 microphones around the stadium collecting sounds. "All of those sounds are collected at the stadium, they are sent via the network to the IBC then converted to Dolby 5.1, shipped back to the stadium [where] they are synchronised with the image and they are returned back to the IBC. That means our sound, before it arrives back here, has already been from the stadium to here, back to the stadium and back to here." UEFA also manages a service called LiveX – essentially a server with canned footage which partner broadcasters can access and share material. You know those aerial shots of the stadiums used by broadcasters before the championship? They'll have come from here. 2,000 hours of footage is produced in total from UEFA itself, with 1,000 hours of it being available via LiveX. UEFA is also hoping to launch the service as an iPad app, where partner broadcasters and, potentially for a fee, consumers will be able to access clipped content as soon as it's produced – and be able to view a goal or red card from all the camera angles that were sent from the stadium. The organisation says it will evaluate the usefulness of the service over the coming months and could be used for the Champions League in the future. If you want to see more from the IBC, check out the BBC's recent video tour of the centre.